Booth spaces are limited and will not be held unless we receive your signed application and payment in full within ten (10) days from the Date of Issue. All payments are final as this is a fundraising event with all proceeds going to the New England Club Managers David Meador Foundation, a 501(c)(3) organization. No refunds are given in the event of cancellation by exhibitor. *Upgraded sponsorships are entitled to additional benefits - please see below. See here for additional information on sponsorship levels and benefits available. In addition to booths at the 2018 NECMA Business Expo, new and current bronze sponsors and above are entitled to a complimentary foursome at the Annual David Meador Scholarship Tournament. 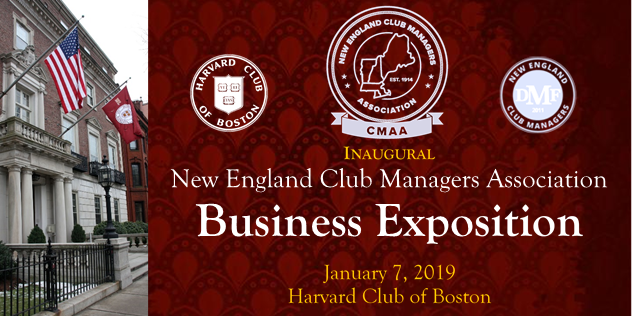 Online exposure, banner signage at the NECMA Business Expo and specific sponsorship marketing opportunities at the Exposition will be commensurate with sponsorship level. Please note the following space/table options. If you have a special request/space requirement, please note below. If you have not already done so, please provide a company description as well as website URL. Will you be inviting more than two company representatives per booth?